Justin Opinion posted a new video on YouTube a few months ago with some great photography, and some genuine silliness. Is he a member here under a different name? Just one remark about the feeding problem with the second (new) pistol. The faillure to go back into battery is most likely due to the shooters position. 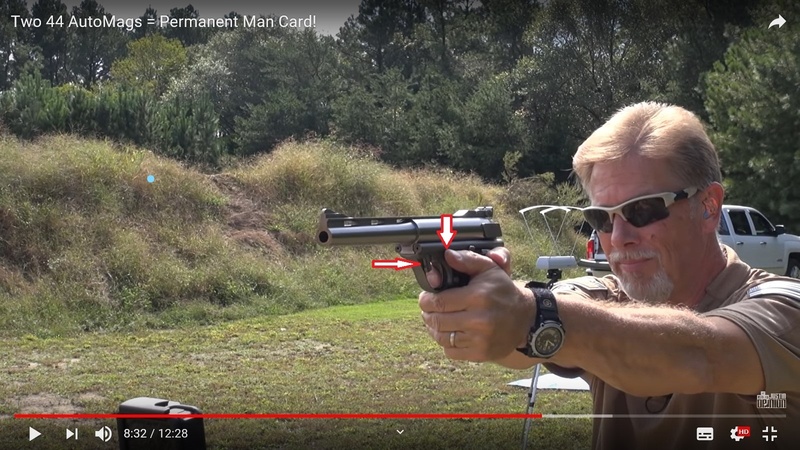 Forget about the IPSC style hold when shooting heavy recoiling handguns and lower your left thumb. Because of the muzzle rise your thumb can (and did here) hit the take down lever. I know it can because I had the same thing (and worse) happen. My barrel dropped and hit the floor... A shaming moment I assure you…. interesting that he makes the claim that he was the first to fire 2 automags together. like many here I did the same in 75 and that was pulling both triggers together. he seems pretty well versed in general shooting and though not real accurate in his shooting does not seem to understand automags real well. reliability comes with a real firm hand and wrist (had to remind my son recently when he had some jambs). Did get a smile out of the "factory loads", must have been some Normas as they were a bit hot. I am fairly certain he is referring to SBR ammo. He did say that it was relatively recently that factory ammo came back into production, so by definition that is SBR. missed that, did not know how hot SBR was loaded so that is why I thought it was Norma since that was loaded pretty hot.